There’s a lot in the next few hundred words that may seem hyperbolic. 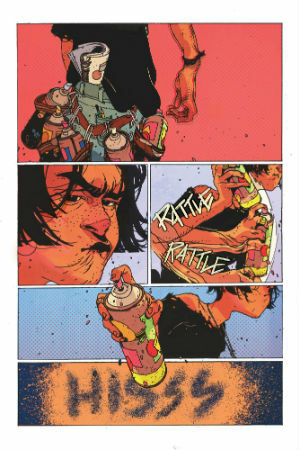 But indulge me for a few paragraphs because when I talk about Grafity’s Wall – the first graphic novel to be published via crowdfunding publisher Unbound – as being a remarkable book I mean it in the strictest definition of that adjective, not as a throwaway signifier of casually effusive praise. 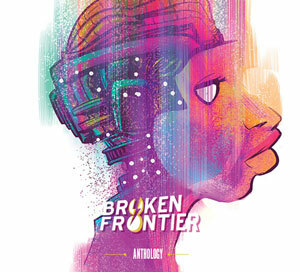 With its multiple nominations in last year’s Broken Frontier Awards, the stunning Anand Radhakrishnan preview WIP art, and the ever rising profile of writer Ram V (who has gone on to Image, DC and Vault Comics recognition since Grafity’s Wall began its journey to print a couple of years back) it’s a project that has had a definite buzz around it since its announcement. But the end product surpasses even those expectations. 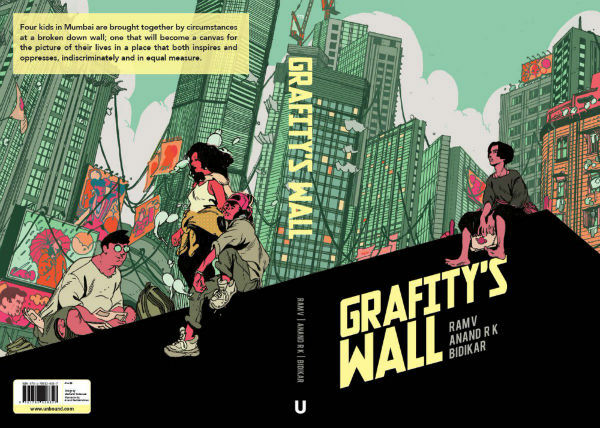 On its most basic level the premise of Grafity’s Wall can be described as the interlocking tales of four teenaged friends and the one focal point in the bustling city of Mumbai that unites them. 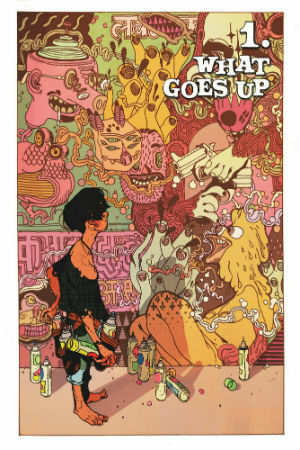 While calling it a coming-of-age is certainly not inaccurate it also seems an inadequate description given the way that environment and narrative merge in these pages. The wall of the title is the only one left standing on an otherwise demolished city site where graffiti artist Suresh (aka Grafity) captures the stories of his friends in an ever evolving mural. It’s a location that binds the characters but it’s also one that will prove to be a pivotal focal point in all their interweaving stories. Grafity’s Wall comprises four chapters focusing on each of the main members of the cast which give the individual characters their own spotlights but also advance an overarching storyline. Among this quartet of friends surviving on Mumbai’s sometimes unforgiving streets are Suresh who has artistic aspirations that seem unlikely to ever be met given the malignant presence at home of his bullying father and his frequent graffiti-related run-ins with the law; his friend the overconfident Jay who is in thrall to local criminal Mario and has no real desire to break away from his dangerous lifestyle; waiter Chasma who is a dreamer with a love of letter-writing even if that takes the form of ephemeral communications to complete strangers; and would-be actress Saira who brings the group closer together by sharing her love of film with them. There are a lot of creators involved in Grafity’s Wall all bringing vital ingredients to the mix and making this a truly collaborative group effort. Ram V’s tautly scripted narrative is a masterclass in pacing, characterisation and carefully crafted, connected plot threads; each segment a discrete entity in itself but also advancing the whole. 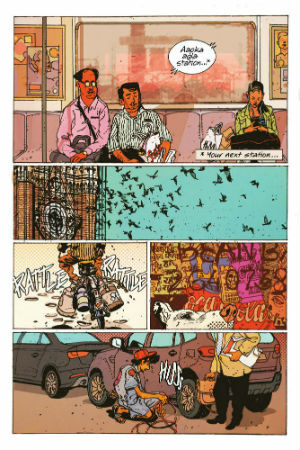 Anand Radhakrishnan’s visuals perfectly complement this, capturing the atmosphere of Mumbai in an almost tangible way. Seldom has a comic ever brought me to a sense of place in the way that Grafity’s Wall does. The reader becomes so engrossed in Radhakrishnan’s pages that they feel engulfed by the surroundings, the atmosphere, the intense claustrophobia of the heaving streets… you almost feel like you can hear the sounds of the city, breathe in its air and take in its smells. 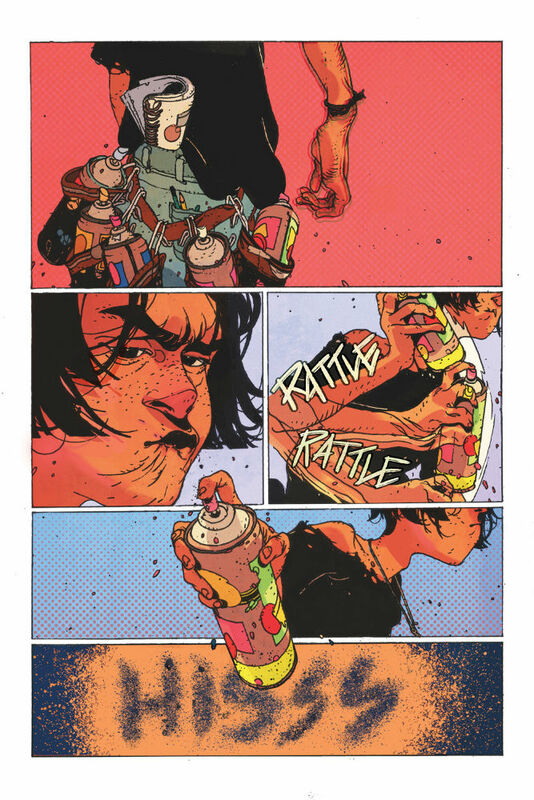 Of course the colours of chiefly Jason Wordie, and also Irma Kniivila and Radhakrishnan, are integral in creating this atmosphere; rich and moody, their kaleidoscopic hues bring Radhakrishnan’s intricate, detailed and busy panels to a vibrant, hectic life. 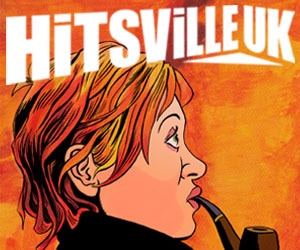 Each character sits somewhere between strict realism and mild caricature ensuring their very personalities are embedded in their visual depictions. 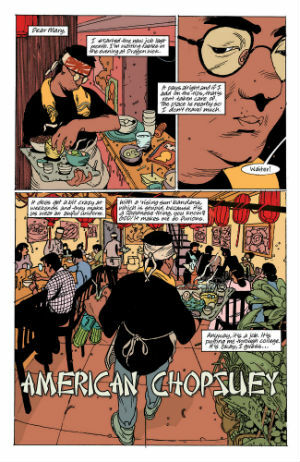 Aditya Bidikar has seemed a ubiquitous presence in comics over the last year or two and the two-time Broken Frontier Award-winning creator’s lettering placement guides our eye intuitively around the pertinent details of each panel with the intimacy of the hand-lettering adding to our sense of connection with the characters. 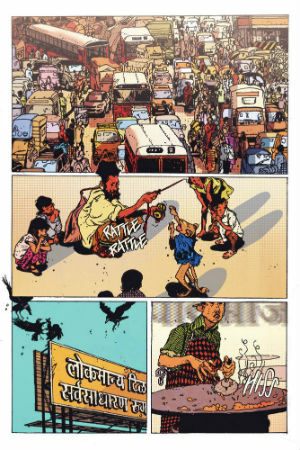 From the preceding paragraphs you will be unsurprised to hear me say that there is, of course, a fifth main character in Grafity’s Wall, and that is Mumbai itself. It’s as vital an influence in the characters’ inter-relationships as their own interactions are; a friend to some and an antagonist to others but always having a fundamental and profound role to play in all their lives. By the end of Grafity’s Wall‘s 125 pages you come to realise exactly how deeply invested you’ve become in this cast in a relatively short page count. If this evocative merging of the psychogeographical and the slice-of-life is a statement of intent from Unbound’s graphic novel range then we all need to be keeping a very close eye on both their publishing output and their crowdfunding comics projects in the months to come. 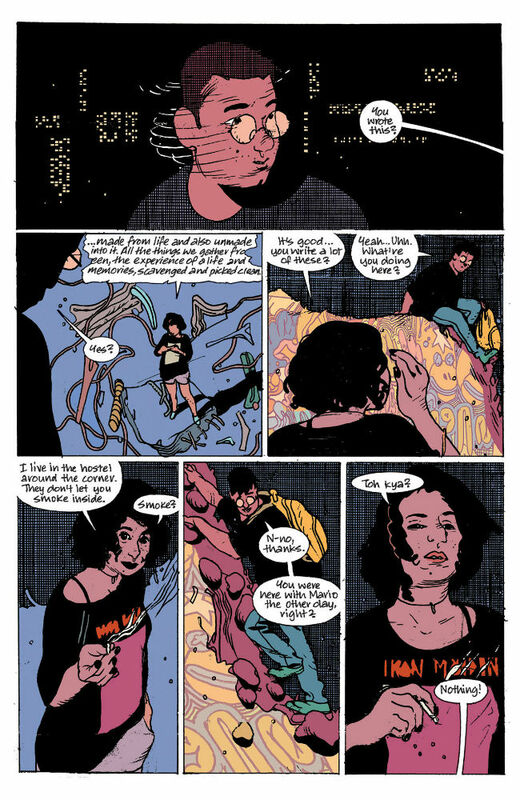 Staff Picks for November 14, 2018 – Grafity’s Wall, The Fade Out, Mister Miracle and More!